Don’t remember the last few kilometres you drove? Missed an exit off the road? Had a near miss or collision? Crossed a lane when you shouldn’t have? Been slow to react or late to brake? If any of the above sound familiar then you have probably experienced driver fatigue. Liberty Insurance has revealed some interesting yet alarming new insights into driver fatigue with some interesting findings for GAA fans that travel to games. New research on driver fatigue was recently carried out by Millward Brown on behalf of Liberty Insurance as part of the ongoing #DriveSafer campaign. 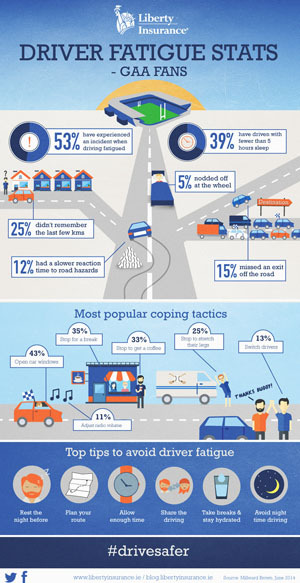 39% of GAA fans admitted to driving after less than 5 hours sleep and 53% experienced an incident such as those highlighted in the infographic. The research also found that GAA fans are more likely than other drivers nationwide to plan for the journey ahead. Make sure you’re well rested, especially before a long journey • Avoid driving alone on long-distance trips. Passengers can both share in the driving and participate in conversation, which can help you stay awake. Allow yourself ample time to reach your destination so you can take advisably frequent breaks. Try to stop about every two hours, or every 150kms. Make a point of getting out of the car and walking at least a short distance, where it is safe to do. Driving for long periods at night makes fatigue much more likely. By avoiding travelling during these hours, you escape the glaring dashboard and road lights. That alone will help decrease your risk of motorway hypnosis. Finally, if you’re losing the battle against fatigue, stop and rest in a safe place. Visit Liberty’s Facebook or Twitter pages for more driver fatigue prevention advice or share your own tips using the #drivesafer. There is also a Driver Fatigue Prevention Guide available to download for free from Mummypages.